Australian education agencies, your performance is going public soon, are you ready? Latest Department of Education changes will make the performance of education agencies public mid-2019. Are you ready? On 10 October 2018 at the Australian International Education Conference 2018, Hon Dan Tehan MP, Minister for Education, committed to publish performance data on education agents in Australia's international education system. And now his promise is truly coming to life. The Department of Education and Training of the Australian government released the strategy the government is aiming at displaying agent performance publicly. "Providing greater transparency of agent performance and allowing comparisons between agents will support providers and students to make more informed choices about which agents they work with. It will also give agents a better understanding of their own performance relative to their peers and encourage continuous improvement." the Department of Education and Training post says. The policy paper was released 11th of January of 2019, at the time of this article, it hasn't being fully implemented, so let's take a look together and analyse the repercussions. The policy strategy released by the Australian government is focused on how the communication is going to be executed. Agents were responsible for 73.6% of all international education enrollments in Australia in 2018. That's unprecedented when comparing to any other international education market, such as the U.S., Canada, and the U.K. While there're is a growing concern on the agents side about regulation changes by the Australian government, the policy paper states clearly that the government does see value on the education agents work: "The vast majority of agents achieve good outcomes by recruiting high-quality, genuine students who complete their courses and abide by their visa conditions." 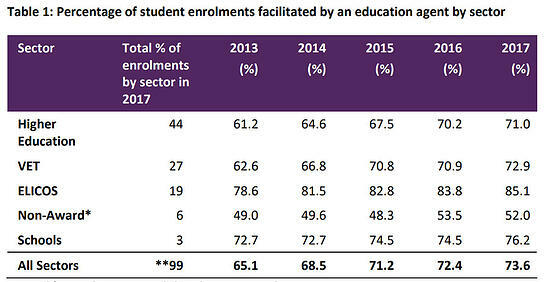 Since 2013, the number of enrolments involving education agents recorded in the Department of Education and Training’s Provider Registration and International Student Management System (PRISMS) has increased by 8.5 per cent. The government notes "[...] in 2017, of Australia’s top 10 source countries for international students, agents were most involved in enrolments from Brazil (89 per cent), Thailand (85.8 per cent) and the Republic of South Korea (84.6 per cent)." The two most important piece of legislation regulating the industry and protecting international students are the Education Services for Overseas Students Act 2000 (ESOS Act) and the National Code of Practice for Providers of Education and Training to Overseas Students 2018 (National Code). Successive Australian Government officials have identified constraints on the government’s ability to regulate agents. The report cites the 2009 Baird Review of the ESOS Act found "[...] there is little scope to regulate the activities of foreign nationals or foreign companies operating outside of Australia." The Government concentrates on improving the information available to providers to support them managing their agents, and encouraging self-regulation by agents. The Australian government expects and wishes the agents to self-regulate. As we discussed in our article Is ISEAA the solution for international education agencies in Australia? there is some movement in the industry toward self-regulation, but remains to be seen if agents will be successful at that. The ESOS Act allows the Government to give information about education agents’ performance to providers, and publish information about education agents’ performance. And the government has started doing that "[...] to support providers to meet their legislative obligations with regard to agents, the department has begun providing performance data on each agent a provider has engaged to represent them." not complete for any other reason. a student visa was cancelled. What the government will publish publicly and what is the impact? It will include the above information and more. And while we don't know exactly how detailed, easy to find, easy to use and comprehensive the report will be, we can expect that the key metrics that define if agents are sending genuine students will be published, because that's what the government expects from agents. For providers: they will gain even more and improved understanding of the agents they have engaged and other agents working in the international education industry, through the availability of a more detailed range of data that allows comparisons. For agents: they will have a better understanding of your and other agents performance. You will be able to compare yourself to others, and of course, they will do the same. And for students: they will be given access to information on the performance of individual agents for the first time. The report focus on the capability of students having a broad understanding and power to compare agents, before not possible: "This will enable them to make a more informed choice from amongst the large range of agents available to them." This is the first step for even more involvement of the Australian government, heading in direction of a more New Zealand-like approach (more in a next article). It's unclear if there's going to be the same or similar information about education providers published by the government. But is this new to the industry? No. The short answer is no. The Australian government is heavily inclined to follow the same standards, communication channels and framework to manage agents of New Zealand. New Zealand due - probably - to the fact of being a smaller market for international education developed much earlier than Australia an unified, solid and comprehensive plan to not only maintain the quality of recruitment but to boost it. We'll get in-depth on how New Zealand is influencing Australia and what New Zealand has managed agents and the international education sector as a whole in another article. The important is, this action from the Australian government is not completely unprecedented. For example, the Australian government plan includes a website where students will be able to search for agents, I wonder where if someone has done it before... Study New Zealand website allows you to search for agents. Perhaps, the most different aspect of both strategies is that the Australian government will release more data - see above. It's all about transparency, so be ready to be questioned by more seasoned students first: they may ask about your numbers, about your visa rejections and the colleges you work with. It's fair to say the majority of students don't understand how the agency business model really works, now with more information available they may understand a little bit more - which is good. We'll let you know when it's been finally released, but you should be prepared to take a look at your stats, create a plan how to improve it if necessary (we will also talk about it in the future) and even how you stack against your competitors. We're still 6 months away from the day the government is publishing the data. No agency was ever hurt by acting with professionalism and transparency, just keep up with the good work. Advancing in its efforts to regulate the industry by pushing for transparency and aiming to get agents to self-regulate themselves, the Australian government is well aware of the importance of agencies, and apparently is trying to slowly scale its efforts to increase quality and health of the industry in general. Coupled with not-as-open-as-before immigration policies, the life of agents is harder than it used to be. Some markets are not performing as well, as before - such as Brazil, and the potential availability of Work & Holiday visas for some markets (mainly Brazil), increased transparency, power on the hands of students, and tighter margins due to increased competition will create a challenging environment for many agents. On the positive side, the industry is set to keep growing, and as its importance increase for the Australian government, we can expect not sudden and disruptive changes. It's not to say that without self-regulation being implemented in an effective way and in a reasonable timeframe, we will not see harsher actions from the government. Overall the future is exciting for the whole industry. But let us know what you think. Do you believe these changes will be positive or negative? Do you think a similar approach to New Zealand will add value to the Australian international education market? A couple days ago the Australian government released new proposed changes that will impact international education agencies onshore and offshore, check out our complete article: The new proposed regulation for education agencies in Australia (Feb 2019). Is ISEAA the solution for international education agencies in Australia?